So far, I am taking the year 2012 in a storm. It started with a cover photo and a double page spread about my blog and recipes. Now I am working as a assistant photographer/food stylist on someone else's cookbook. It started only this week, and will go on for a month or so. It's hard work to be creative on demand with the clock ticking in the background, but I am loving every single bit of it. It's a whole different league than taking pictures for a blog, I find. For my blog, I usually don't spend more than 30 minutes on a shoot, incl. set-up. That's also because I already spent some time cooking the dish. Now with the cookbook, everything is ready and cooked. We have to dish it up, make it look pretty and set the "table", and photograph it. This, in the longest case so far, can take up to 2 1/2 hours. I am drained after each day, but happy. Another fact, that I didn't realize before: it's very physical. I don't sit for one second during the shoot. It's constant bending, shifting, kneeling, holding, carrying, straightening, tidying, running back and forth ..... you name it. Believe it or not: once I come home I still feel like cooking something nice and new and sometimes even photograph it for my blog. In a way, it relaxes me to be home in my own kitchen. Because the photo shoots are so tiring, I am in need of hearty but quick meals for dinner. 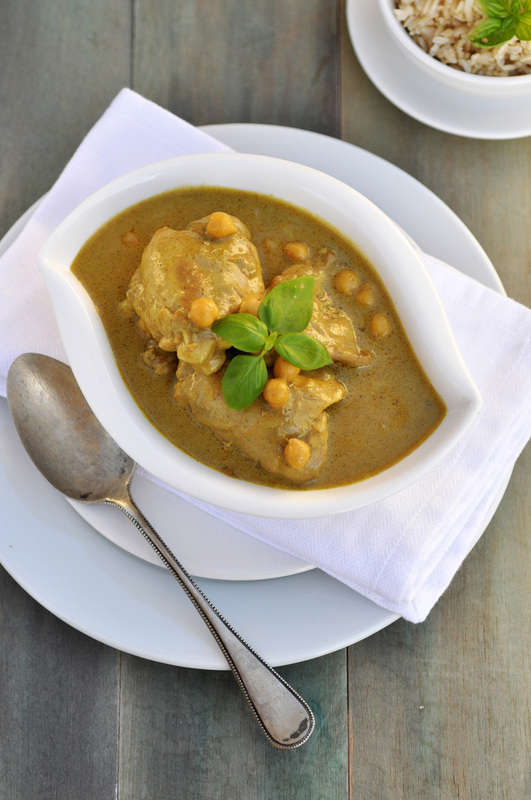 Just the right time and place to share my Chicken Curry in a Hurry with you: ready to serve in less than 30 minutes, hearty, full of flavor, filling and good for you. Dishes like these are perfect for cold winter nights and comforting after a long day's work. It's one of our family staples. Leftovers are great to eat the next day. Bon Appetit! Heat olive oil over medium heat. Add chopped onions and cook until softened. Stir in minced garlic and grated ginger and cook until fragrant, another minute or so. Add the chicken thighs and cook until the outsides of the chicken is no longer pink. Stir curry powder chili and salt into the chicken onion mixture and cook for 1-2 minutes. Add the coconut milk. Bring to a boil, then cover and simmer over low heat for 15 minutes. Add cooked chickpeas and cook for another 5 minutes. Serve with brown rice.